The Multiverse - is our Universe only one of many? The multiverse - the theory that there is an infinite number of universes besides our own - is something that is gaining more and more popularity amongst the scientific community. What you read on this page may seem incredible and even crazy, but in recent years, there have been tentative suggestions that the multi-universe is probable rather than possible. It may surprise you to know that the term "multiverse" was first coined as far back as 1895, but it was not by an astronomer. It is perhaps telling that the concept first came to the mind of a philosopher - American William James. The concept of the Hubble volume is something that needs to be clarified before we go any further. Put simply, it is the amount of space we can observe, beyond which space is expanding faster than the speed of light. In other words, within the Hubble volume, light will be able to reach us; beyond that, the space comprising the rest of the Universe is moving away faster than the light leaving it, meaning we'll never be able to see it. It can be thought of as a sphere and we, at the centre of it, are isolated from anything outside of it. It is a sort of cosmological event horizon. This Swedish-American cosmologist, together with American theoretical physicist Brian Greene, hypothesized four levels of multiverse. Each subsequent level could encompass the previous one(s). 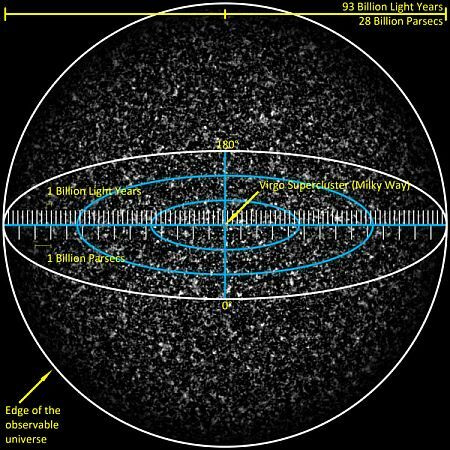 This is the idea that, beyond our own Hubble volume, there are many others, maybe extending to infinity in all directions. The criterion here is that they all will have the same physical laws and constants because, essentially, they're all part of the same "super-Universe", but are totally separated from us by the cosmological horizon. Their configurations, however, such as the distribution of matter, may differ significantly. If it is true that there are an infinite number of these volumes, then at least one - more likely many - will have a configuration identical to ours. Tegmark estimates that there could be one such at a distance away from us in metres of 1024 multiplied by itself 118 times. This, as you can imagine, is a very big number indeed. This idea suggests that the Multiverse is continuously expanding and, as it does so, "bubbles" are formed, which stop expanding, allowing the formation of stars and galaxies. Each bubble is, in effect, a level one universe. The difference here is that different bubbles will operate according to different physical laws and constants. Believe it or not, the possible number of these bubbles has been calculated as 10,000,000,000 multiplied by itself 10,000,000,000 times! That is a number that would take longer than the age of our Universe to write down. Level Three: The "Many Worlds Interpretation"
Quite a controversial one, this. The "Many Worlds Interpretation" (MWI) was first proposed by Hugh Everett in 1957. Put very, very simply, the idea stated that any action with more than one possible outcome actually realized every one of these outcomes. We, as observers, only see one, of course, but all the other outcomes went on to exist in other, parallel universes. This idea is demonstrated quite nicely in the movie Sliding Doors, where there are two parallel stories - one when the heroine catches her train, the other when she doesn't. The outcomes of these two possibilites result in her life going in two totally different directions. So, Max Tegmark named these parallel universes as Level Three, in which all possible outcomes to all possible events exist simultaneously. They are totally detached from our Universe. Let's see if you can get your head around this concept. Max Tegmark initially invokes something called the "external reality hypothesis", which basically means that the ultimate reality must be independent of us human beings - free from the language we use to describe it. The only way to describe it, therefore, is using mathematics. This idea has been around for some time, proposed in various forms by such great minds from the past as Pythagoras, Plato and Galileo. Tegmark goes on to suggest that mathematics is so good at describing our reality because it actually is the reality. The Universe is a mathematical structure with just the right equations to make it fine-tuned for our existence. This then leads to a question posed by American physicist John Wheeler: "Why these particular equations and not others?". Tegmark simply states that all other possible equations govern other, parallel universes - and their number could be infinite. Because every mathematical equation is covered here, there can be no Level Five multiverse. This is the limit of reality. Is There Any Evidence Of The Multiverse? There have been a few observations of, and theories about, our Universe that tentatively suggest the possible existence of other universes besides our own. "CMB" stands for cosmic background radiation, which is thought to be the residual radiation left over from the Big Bang. It is the oldest electromagnetic radiation in the Universe and can only be observed by radio telescopes. In theory, it should be uniformly distributed throughout the cosmos. Over the years, there have been NASA missions attempting to map the CMB, each with inceasing accuracy. First, COBE (standing for Cosmic Background Explorer), was launched on its four-year mission in 1989. As you can see, the result has no real detail to speak of. Then there came the Wilkinson Microwave Anisotropy Probe, launched in 2001, which showed a great improvement. 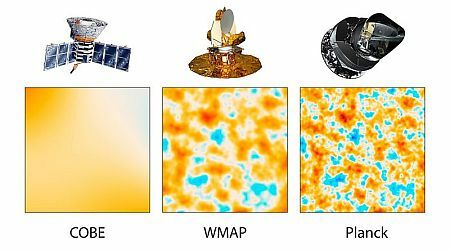 Finally, this was superseded by the Planck Cosmology Probe, launched in 2009, displaying the most accurate information to date. In fact, the results were only released to the general public in March 2013. 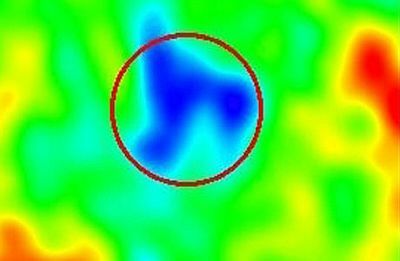 WMAP was the first to detect an anomaly present in the CMB's uniformity. In the southern hemisphere, in the direction of the constellation Eridanus. This billion-light-year-wide area displayed significantly lower temperatures than any of the minor fluctuations that scientists expected. Naturally, explanations needed to be put forward to explain this major anomaly. One such was the existence of a "supervoid" between us and the CMB. This is an empty area of space containing little or no galaxies, but the problem was, in this case, that it would have to be 1,000 times larger than other known supervoids to account for the Cold Spot. It was American physicist Laura Mersini-Houghton who proposed the controversial theory that the Cold Spot was the imprint of another universe that either collided with, or was once connected to our own. There has also been a tantalising theory put forward that the cold spot is a hole in the "brane" of our Universe, allowing passage through it into other dimensions - or even other universes! This phenomenon is dealt with in detail elsewhere on this site here. It appears that a ridiculously large number of galaxy clusters is speeding towards a small part of the sky in the vicinity of the constellations Centaurus and Vela. It has been suggested that this motion is being generated by the gravitational pull of something outside our own Universe. Once again concerning anomalies in the CMB, this phenomenon was first discovered by theoretical physicist Roger Penrose, of Oxford University, England. After studying the data produced by WMAP, he discovered what appeared to be a series of large concentric circles. He proposed the controversial suggestion that they allowed him to "see" through to a period before the Big Bang. A less controversial explanation (though still controversial) is that they are ripples caused by a collision with another universe. For many years, the Universe was thought to exist according to the "principle of naturalness", referred to as the Standard Model. This was responsible for the relative sizes of particles. In the past, when a particle was discovered that didn't conform to this, there was usually another force or mechanism subsequently discovered to explain it away. Then, at the Large Hadron Collider, at CERN in Switzerland, the Higgs Boson was discovered. Scientists were surprised to find that it was much smaller than expected. So, as in the paragraph above, they set about looking for any other particles, forces or mechanisms that would account for this. But nothing was found. This puts things in a bit of a quandary. The only explanation, it seems, is that the Universe isn't "natural" at all. There is a Multiverse in which the size of the Higgs Boson varies randomly in different universes and we just happen to be in one where it has an unnaturally small size to allow for the creation and existence of life. For this to happen, that our Universe is incredibly finely tuned to be just right for life to exist, there must be an infinity of other universes (the Multiverse), where all other permutations are tried out. We live in an "unnatural" Universe, where its physical laws are the result of totally random quantum fluctuations.